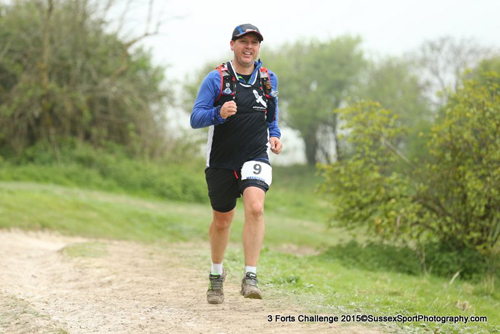 Last year I enjoyed a beautiful scenic run up and down the South Downs via the Three Forts Challenge Half Marathon. I was in great shape, the weather was balmy, and the views were stunning. I was the proud owner of a 1:52:12 chip time finish that did justice to the hilly course. 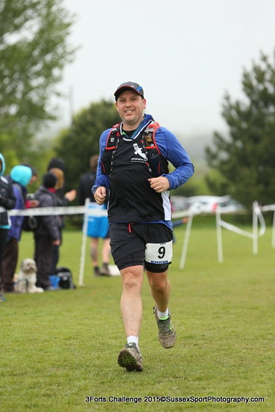 I vowed to return in 2016 for ‘The Tough One’ – 27 miles of mixed terrain and climbs of 3450 feet. I returned in mediocre shape, the weather was cold & wet, and the views were non-existent due to rolling fog. I was looking forward to the run though, the tougher the conditions then the more I seem to enjoy the challenge. The race village was muted this year thanks to the dull weather conditions, with runners crowded under shelters setup in preparation for the post race massage tables. I bumped into Stephen Cousins from Film My Run who I can rely on seeing if there’s a trail race somewhere between London and Brighton (sometimes even in London). Stephen put together his customary excellent video on YouTube and I recommend that you go check it out (and remember Film My Run if you’re interested in someone recording your run or event in future). The marathon ultra marathon 27(ish) mile runners start first so the half marathon runners cheered us off as they continued to shelter from the rain. The first section of the course remains the same for both races and I remembered that the first section consists of a narrow uphill path. Last year this was problematic because I was aiming for a decent time but I had no worries this time round so I was happy to be near the back of the field. Thankfully the rain stopped but the air remained damp with low visibility due to the fog. I warmed up despite the conditions so the waterproof jacket went into my vest pocket and off I trundled up and down hills. Our course split off for the long out and back section to Devil’s Dyke. The trail meandered through woodland, provided beautiful views down into the valley (the only section not dominated by fog), and then followed the River Adur. This is where the suffering started. I could see s steady stream of runners slowly progressing up & up & up into the fog. The trail rose upwards and I was soon joining them in the cold damp air. The trail turned to tarmac where visibility became shorter & shorter. The muffled sound, damp conditions, lack of other runners, and the unrelenting upwards slope played havoc with my mind. The odd spell of walking crept into my ascent until a few runners trudged past me and I started my uphill shuffle, keeping them in sight and the misery of the conditions out of my mind. A brief stop at the aid station for some biscuits and orange squash and I was off following the unknown runners in front. That’s when the conditions worsened and my mood improved. Boring roads with waves of damp fog, that’s enough to drag me down. Exposed ridge lines with fierce wind, billowing fog, and rough trail; that’s the type of misery I can embrace and fight my way through. The worse the conditions and the more hazardous the run and I accept that challenge with a wry smile. 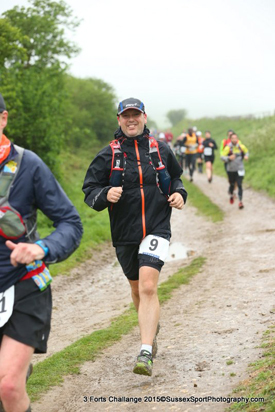 Runners were now streaming past in the opposite direction as they had completed the out and back section to Devil’s Dyke itself. 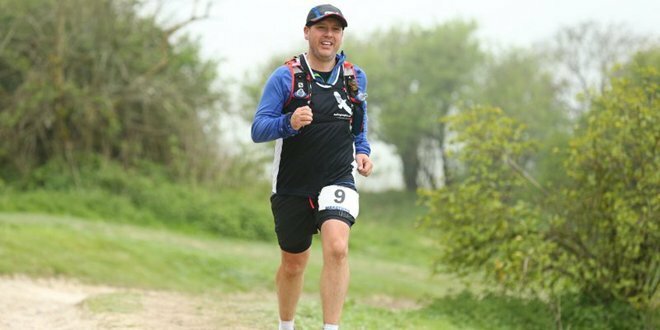 I was running and overtaking once more until the warm smiles of the volunteers at Devil’s Dyke wished me well for the return journey. I could see the deranged happiness of the runners I now passed, the runners who were fighting their battle to the end of the trail. I finally broke out of the fog as the route descended back into the valley and a fuel stop of biscuits and squash saw me running back up the other side of the valley next to a pig farm. The huge adult pigs rummaging in the mud, ringed by fences to keep them in their set areas. However, their piglets could roam through the fences and were squealing away on the trail as us runners continued ever onward. I couldn’t resist a short break to watch their fun & games. The rest of the course became a blur of clear valleys and fog bound ridges until the course suddenly became familiar; we joined the half route again. I could start to picture how far was remaining, the fun I had last year bombing it down rocky descents. I started to overtake again. I glanced at my watch only to realise that the battery had given up somewhere in the fog. A final turn and I was back on the first hill, the near single file track that runs next to the golf course and back down to the race village. I can see a few runners ahead so latched onto them, telling myself that every stride was taking my closer to the finish and my last (successful) attempt to overtake. I finished with a smile on my face and another trail race complete. I can even chalk this up as a marathon finish thanks to the 27(ish) miles. Next year? I’ll be back and hoping for stunning hilltop views. If it’s misery again though, well, I’ll smile and fight my way round.